National Trust owned Tudor and Stuart Grade 1 mansion complete with Elizabethan stables. 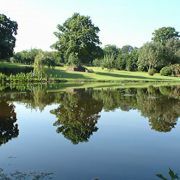 Surrounded by formal gardens (c.1500), orchards, bluebell woods and extensive estate. 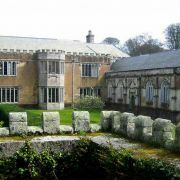 Godolphin House, a Tudor and Stuart mansion with a historic garden that ranks as one of the most important in Europe, is one of Cornwall's best-kept secrets. 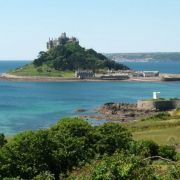 Located just fifteen minutes from St Michael's Mount and half an hour from St Ives, the six-hundred-acre estate features archaelogical remains ranging from Bronze Age enclosures to nineteenth century mine buildings, gorgeous woodlands and a display of antique farm wagons housed in sixteenth-century stables. 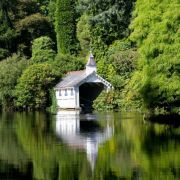 The Godolphin family made their money through tin and copper mining before selling their estate in 1929 to artist Sidney Elmer Schofield, who devoted the rest of his life to restoring it. When Schofield died the house and gardens passed to the National Trust, who carried out their own extensive restorations before opening up the property to the public. Among many items of interest in the house are remnants of salvaged shipwrecks, such as a carved ceiling in the dining room that was taken from a Portuguese boat that sank in Mounts Bay in 1526. 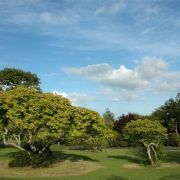 The medieval gardens can be visited from March to October, while the impressive six-bedroom mansion is open to the public during the first week of every month, and available as a holiday let the rest of the time. There are excellent disabled facilities, plant sales and a cafe serving hot drinks and local produce.